Joseph Monroe was born on 31 May 1854 in Jefferson County, Illinois as a twin to Reuben Cicero Claybourn. The twins were always known by their nicknames of “Bitts” and “Bull” which came about because one of the babies (Joe) was smaller than the other, so he was his parents “little bittsy boy” while the other was their “big bully boy.” Joseph Monroe’s name is listed first in the family Bible, so he is presumed to be the eldest. They looked very much alike. Here men work at the Mt .Vernon Car Manufacturing Company. Joe’s brother, Jim, can be seen in the back with a beard and white hat. Joseph’s headstone at the Jordan Chapel Cemetery in Jefferson Co., Ill.
Joe (Uncle “Bitts”) lived with his brother Bill at Foxville, near Walnut Hill, Illinois, and worked for him selling wagons. He married (1st) Sarah Emeline Easley on 15 August 1879 in Marion County, Illinois. [Sarah Easley was born on 18 March 1860 in Marion County, Illinois.] Together they had one daughter, Ida, listed below. A month after this birth Sarah died on 7 April 1880 in Field, Illinois from lung fever according to the 1880 census mortality schedule. She is buried in the Wham Hill Cemetery in Marion County, Illinois. On 15 February 1883 he married (2nd) Harriet (“Hattie”) McCrary and together they had nine children, listed below. [Hattie McCrary was born on 30 October 1862 in Jefferson County, Illinois.] They lived at Dix, Illinois, where Joe engaged in farming. At one time they lived in Mt. 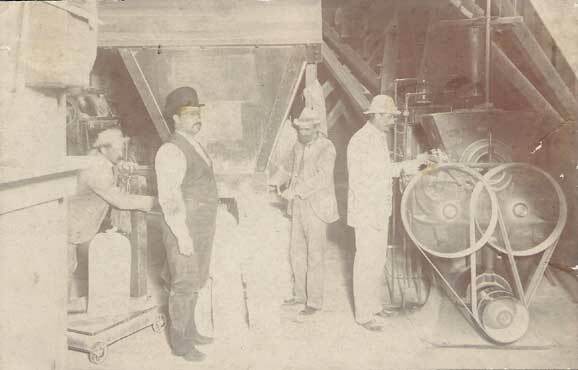 Vernon, and he worked along with his brother James H. Claybourn in the Mt .Vernon Car Manufacturing Company. Joe, as well as a good many of the other brothers, had considerable mechanical ability. He invented a plow, but someone else who was working in the shop with him patented it. After the 1920 census taken in January and before his death in 1927, Joe married (3rd) Margarett Ann “Amanda” Huey. [Amanda Huey was born on 2 May 1854 in Perry County, Illinois.] She died on 11 February 1927 in Mt. Vernon, Jefferson County, Illinois. Her death record said she was an invalid living at the County Farm and was buried the next day in Pleasant Hill Cemetery in Jefferson County. Joe died on 28 August 1927 in Union County, Illinois. He and his twin are buried at Jordan Chapel Cemetery just east of Dix, Illinois. Ida Mae Claybourn was born to Joseph Monroe Clayborn and Sarah Easley in December of 1879 in Field, Jefferson County, Illinois. She was described as a pretty girl by one who knew her. She married Charles N. Free on 12 February 1896 in Jefferson County but they later divorced. [Charles Free was born on 1 January 1873 in Jefferson County, Illinois and died on 21 January 1943 in Jefferson County, Illinois.] While some official records suggest ambiguity on the date, she married (2nd) Roy G. Stewart, likely on 17 March 1900 in Logan County, Illinois. [Charles Free was born on 1 January 1873 in Jefferson County, Illinois and died on 21 January 1943 in Jefferson County, Illinois. An Illinois state marriage record says Ida M. Clayburn married Roy G. Stewart on 17 March 1900 in Logan County, Illinois. There is a 1900 census record in East Lincoln, Logan County, Illinois for Leroy G. Stewart, a house painter, born in October of 1868 in Illinois to parents born in Pennsylvania, living with a wife named Mae who was born December 1879 in IL to parents born in Illinois, but it says they have been married for two years. There are no other records for Leroy G. Stewart in any other census. However, there is a Roy Green Stewart born 6 June 1879 in Jefferson County, Illinois, and died on 21 April 1955 in Jefferson County, Illinois. He is listed as single and living with his parents on their farm as of the 1900 census. He enlisted in the military from 23 August 1907 through 22 August 1910. In the 1910 census he is stationed with his unit in Sheridan County, Wyoming and listed as widowed. Upon his release he returned to Jefferson Co, Illinois, married, and had four children.] She never had children. William Spencer Claybourn was born on 18 April 1884 in Jefferson County, Illinois. On 1 March 1904 he married Leta Maude Whitlock, a second cousin. [Leta Whitlock was born on 8 August 1886 in Jefferson County, Illinois. She was the only child of George Elmer Whitlock (1865-1943) and Drucy Alva Starnes (1868-1944), daughter of Mary Catherine Claybourn (1839-1910).] They had nine children together, listed below. Leta died on 24 December 1921 in Jefferson County. On 10 November 1924 William then married Mabel Kell. [Mabel Kell was born on 11 April 1895 in Jefferson Co., Illinois.] William died on 14 June 1935 in Irvington, Illinois. 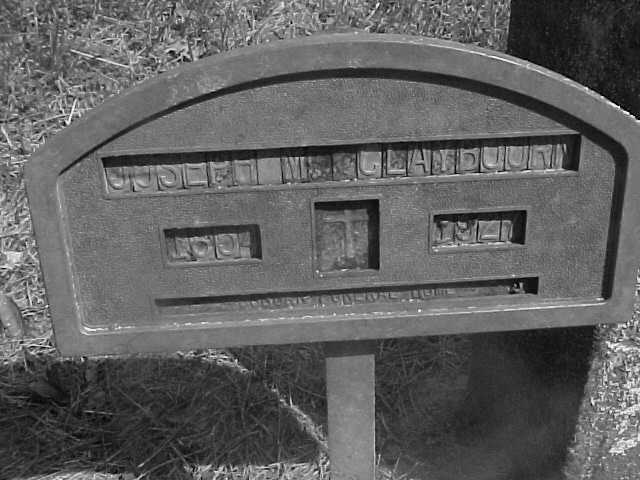 William and his first wife Leta are both buried in Jordan Chapel Cemetery in Jefferson County. Mabel died after the 1940 census when she was living as a widow in Jefferson Co., Illinois. Archie Loren Claybourn was born on 24 April 1905 in Jefferson County, Illinois. He married Helen Lucille Self, who was born on 10 August 1917 in Irvington, Washington County, Illinois. Archie died on 24 April 1951 in Centralia, Illinois, and Helen followed on 26 January 1991 as the wife of Gus Howard Emrick (1915-1992). They are buried in Richview Cemetery in Washington County. Eva Joan Claybourn was born on 3 July 1936 in Centralia, Illinois. Edna Fern Claybourn was born on 13 September 1937 in Centralia, Illinois. Alvia Harriet Claybourn was born on 21 February 1907 in Jefferson County, Illinois. On 28 June 1924 Alvia married John Russell Chapman in Marion County, Illinois. [John Chapman was born on 23 May 1908 in Marion County, Illinois.] They divorced in about 1929 after having two sons, listed below. [John Chapman died on 27 January 1953 in San Bernadino, California.] In about 1932 Alvia married Theodore Louis “Ted” Arning and together they had three children, listed below. [Ted Arning was born on 30 April 1894 in Irvington, Illinois.] He had also been previously married, with no children by the 1930 census. Alvia died on 3 March 1975 in Centralia, Illinois. She is buried in Elmwood Cemetery in Marion Co., Illinois. Ted died about a year later in June of 1976, also in Centralia. Virgil Leroy Chapman was born in 1925 in Marion Co., Illinois. In about 1945 he married Shirlee Nadene Bell. [Shirlee was born on 6 September 1925 in Logan County, Illinois.] From 1946 through 1952 they lived in Pekin, Tazewell County, Illinois. Shirlee died in April of 1983 and Virgil died in 1991. They are buried in New Union Cemetery in Logan County, Illinois. Charles Lee Chapman may have been born on 12 April 1928 and died on 6 June 1975, after having served in the U.S. Army from January 1950 to April 1955. This Charles L. Chapman is buried in Jefferson Barracks National Cemetery in St. Louis County, Missouri. William Dean Arning was born in December of 1933 in Marion Co., Illinois. Fred Dewain Arning was born on 9 February 1936 in Centralia, Illinois. He married Joan Hagood and together they had two daughters. Fred proudly served his country in the Missouri National Guard for 10 years. He was a self-employed Painter in the Parkland area for many years. Fred was an avid racing fan and was a long-time member of the First Assembly of God Church of Farmington, Missouri. He died on 14 January 2010 in Farmington, Missouri. He is buried there in Parkview Cemetery. Richard Lewis Arning was born on 13 May 1942 in Marion Co., Illinois. Sylvia Lorene Claybourn was born on 28 October 1908 in Jefferson Co., Illinois. In about 1928 she married Allen Leroy Faulkner. [Allen Faulkner was born on 4 June 1906 in Marion Co., Illinois.] At least some of the family moved back to Centralia by 1945 because daughter Leta is pictured as a senior in a 1949 yearbook listing activities through her four years of high school, and daughter Betty is pictured as a junior in a 1950 yearbook. Allen died on 14 January 1952 in Baltimore, Maryland. He is buried in Elwood Cemetery in Marion Co., Illinois. At some point Sylvia married a Mr. Bogan because that is her married name at death. Sylvia died on 12 April 1985 in Centralia, Illinois. She is buried in Calvary Cemetery in Marion Co., Illinois. Leta Rose Faulkner was born in about 1931 in Illinois. Betty Joyce Faulkner was born in about 1933 in Illinois. Noal Spencer Claybourn was born on 25 July 1911 in Jefferson Co., Illinois. Noal died on 30 November 1933 in an auto-train accident in Irvington, Illinois. His death record indicates he was single and had been living in Irvington for 7 years. He is buried in Jordan Chapel Cemetery in Jefferson Co., Illinois. Nina Irean Claybourn was born on 31 January 1913 in Jefferson Co., Illinois. She married Max John Beck on 26 August 1934 and they had two children, listed below. [Max Beck was born on 20 January 1910 in Centralia, Illinois.] Nina died on 21 September 1954 in Marion County, Illinois, and her husband Max died on 26 February 1985. They are buried together in Hillcrest Memorial Park Cemetery in Marion County. Max Duane Beck was born on 11 December 1937 in Marion Co., Illinois and lived in the St. Louis area. Doris June Beck was born on 25 January 1921 in Marion Co., Illinois. She worked at Illinois Bell for 40 years and was a faithful member of Woodridge United Methodist Church. Doris died on 19 February 2013 in Woodridge, Illinois. Lena Margert Claybourn was born on 4 September 1915 in Jefferson Co., Illinois. She married Wilbur Erastus Walton in about 1932. [Wilbur Walton was born on 25 June 1911 in Centralia, Illinois.] Lena died on 29 August 1996 in Centralia, Illinois. Wilber died on 3 September 2006 in Nashville, Illinois. Delores Loreine Walton was born on 8 May 1933 in Marion Co., Illinois. Delores died on 17 September 2011 in Centralia, Illinois, with her married name as Bierman (which she changed in February 1969). Carolyn Jean Walton was born on 1 July 1935 in Marion County, Illinois. In about 1955 she married Donald Hill Martoccio in about 1955 and they had three sons, listed below. Donald served in the U.S. Coast Guard from March 1954 to January 1958 as petty officer, second class at South Portland Maine Coast Guard Base and also Brant Point Lifeboat Station in Nantucket Island. Donald grew up in Centralia, Illinois where as a young man ne worked with his brother, father and grandfather in the family’s business, Hollywood Brand’s Candy Company. He was also owner-operator for several years of King Laundry and King Bar-B-Q. After he retired in 1989, Carolyn and Donald moved to Naples, Florida. Jean died there on 14 August 2000 and Donald followed on 10 January 2015. Donald Michael Martoccio was born on 13 August 1956 in Nantucket County, Massachusetts and died on 16 November 2012 in Sandoval, Illinois. Steven L. Martoccio was born in 1958. Jeffrey D. Martoccio was born on 31 March 1964 and died in January of 1988. An infant son Claybourn was born and died on 2 January 1917 in Jefferson Co., Illinois. He is buried there in Jordan Chapel Cemetery. Doris Leona Claybourn was born on 21 February 1918 in Jefferson Co., Illinois but died there about two years later on 1 November 1920. She is buried there in Jordan Chapel Cemetery. Wilma Maxine Claybourn was born on 25 October 1919 in Jefferson Co., Illinois. Wilma died on 24 February 1920 in Jefferson Co., Illinois. She is buried there in Jordan Chapel Cemetery. A stillborn infant son was born and died on 22 December 1921 in Jefferson County, Illinois. He was buried the next day in Jordan Chapel Cemetery. Elroy Claybourn was born on 21 January 1886 and died shortly thereafter 24 May 1886 in Jefferson County, Illinois. He is buried there in Jordan Chapel Cemetery. Fred Ivan Clayborn was born on 7 March 1887 in Jefferson County, Illinois. He and his progeny spelled the surname as “Clayborn.” He married Nona Elnora Tate on 26 September 1904 in Marion County, Illinois and together they had eleven children, listed below. [Nona Tate was born on 28 August 1886 in Jefferson County, Illinois, the daughter of Jeff Tate.] Fred died on 22 February 1936 in Glacier County, Montana. Nona died on 11 September 1975 in Havre, Montana. They are buried there in Highland Cemetery. Beatrice Elnora Clayborn was born on 25 July 1905 in Illinois. On 20 November 1920 she married William Marion Vernier in Hill County, Montana. [William Vernier was born on 13 September 1892 in Scioto County, Ohio. He crossed into Canada on 11 May 1922 and settled in Vancouver, British Columbia, Canada, where he died on 11 February 1975 was was buried in Mountain View Cemetery there.] In the Yuba City, California city directory for 1948 and 1950, Beatrice is living with husband Joseph J. Foekl. Beatrice died on 2 May 1984 in Yuba City with a married name of Foekl. Edna Mae Clayborn was born on 27 March 1907 in Illinois. On 5 September 1923 in Hill County, Montana, she married (1st) to James Harold Moyer (born on 9 October 1900 in Missouri). Together they had two children, listed below. As of the 1930 census the family was living in Blaine County, Montana. As of the 1940 census they were living in Boundary County, Idaho, with a notation that in 1935 they had lived in Havre, Montana. It looks like they were living in Tacoma, Washington, per city directories for 1942 and 1945 where James was working as a chipper. They probably divorced in about 1946. 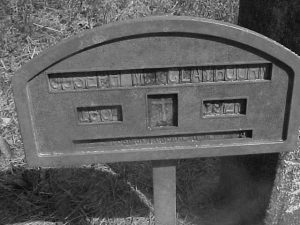 [There is a grave in Grandview Cemetery in Boundary County, Idaho, for James H. Moyer who died there on 16 November 1969.] Edna married (2nd) on 13 October 1947 to Loman Edward “Ed” Christian (born on 13 October 1922 in Raleigh County, West Virginia). They lived in Marysville, Yuba County, California. Edna died there on 10 March 1978 and Ed died on 23 May 1999 in Butte County, California. They are buried together in Sutter Cemetery in Sutter County, California. Robert L. Moyer was born in about 1925 in Montana. Geraldine Gloria Moyer was born on 14 January 1927 in Havre, Hill County, Montana. She married (1st) to a Mr. Smith in about 1946. She married (2nd) on 27 December 1970 in Nevada County, Californai, to Robert E. Gray. Geraldine died on 27 August 2005 in Yuba City, Sutter County, California. Susie Belle Clayborn was born on 12 December 1908 in Illinois. She married Chester Theodore Nelson on 20 March 1928 in Hill County, Montana. [Chester Nelson was born on 15 September 1902 in Minnesota.] Together they had two children, list below. Susie died on 3 September 1982 and Chester died on 30 March 1987, both in Havre, Montana. They are buried in Highland Cemetery in Hill County, Montana. Aileen Nelson was born on 6 September 1928 in Hill County, Montana. Juanita P. Nelson was born on 8 February 1931 in Hill County, Montana. On 6 May 1950 she married Donald Eugene Vandeberg. [Donald Vandeberg was born on 19 July 1931 in Hill County, Montana.] Juanita died on 3 December 1997 and Donald died 24 March 2010, both in Kootenai County, Idaho. They are buried there together in Coeur d’Alene Memorial Gardens Cemetery. Harold F. Clayborn (known as “Sam”) was born on 28 January 1911, probably in Douglas County, Illinois. On 1 May 1937 he married in Hill County, Montana, to Margaret Elizabeth Flatness (born there on 7 April 1918). They had four sons. Margaret had a dairy farm and later ranched and farmed south of Havre in Beaver Creek Park. Sam died on 22 November 1962 in Hill County and in about 1964 Margaret married (2nd) to widower Lowell Oris Golie (1913-1994). She died on 6 March 2006 in Cascade County, Montana. Dale Clayborn was born in about 1939 in Hill County, Montana. donor of the year award by the Hospitalized Veterans Association. He was also a good mechanic and spent his time working on the farm and fixing cars and farm machinery. He worked for various oil rigs, Heltne’s Service Station, Buttrey’s, and Hi-Line Dodge. He was also a member of the National Guard. Dean died on 30 May 2005 at the Clayborn farm from a tractor accident. Edward Ershal Clayborn (known as “Jack”) was born on 20 April 1913, probably in Douglas County, Illinois. He enlisted in the U.S. Army during World War II and served from 22 March 1942 through 18 October 1945. He is listed as a farmer in Havre area city directory both before and after his military service. Jack died 24 April 1970 in Hill County, Montana. He is buried there in Highland Cemetery. Juanita Pearl Clayborn (known as “Joni”) was born on 28 June 1915, probably in Douglas County, Illinois. On 25 July 1932 she married Patrick Joseph LaSalle in Hill County, Montana. [Patrick LaSalle was born on 14 March 1907 in Montana.] They had six children, all listed below. Patrick died on 12 April 1964 in Lewis and Clark County, Montana and is buried there in Resurrection Cemetery. Juanita later married Harry Gunstone in about 1970, who had been previously married three times. [Harry Gunstone was born 25 September 1905.] Harry died on 14 June 1987 in Spokane County, Washington. He is buried in Montana State Veterans Cemetery. Juanita died on 27 June 1997 in Lewis and Clark County, Montana and is buried there in Resurrection Cemetery. Edwina LaSalle was born on 26 October 1933 in Havre, Hill County, Montana. She graduated from Sandpoint High School in Sandpoint, Idaho, and married Virgil A. Jenkins (1928-2010) in her senior year on 31 December 1951. Edwina served her community for over thirty years by volunteering at St. Vincent de Paul, Catholic Daughters, and the Veteran’s Pow Wow. In 2007 she received a community service award for her dedication to the community. Her love for people and selfless acts of kindness became a hallmark that touched a multitude of lives. She loved her family greatly and took many under her wing. Her favorite saying was “Love greatly and forgive always.” Edwina died on 28 November 2014 in Jackson County, Oregon, and she is buried there in Eagle Point National Cemetery beside her husband Virgil. Patrick Leon LaSalle was born on 14 December 1935 in Hill County, Montana. After high school Patrick enlisted in the U.S. Army to serve from 23 July 1954 to 11 July 1956. He enlisted so that someone else might not be drafted and spent the Korean War in Tokorozawa, Japan with a maintenance unit. Pat also completed eight years with the Army Reserves in Helena. Although he left Helena temporarily a couple of times in his adult life, he always maintained a home there and loved the wide open skies and the sunshine the valley had to offer. On 15 February 1958 he married (1st) Mavis Marie Atkins (called “Mazie”) in Lewis and Clark County, Montana, but they later divorced. [Mavis Atkins was born on 6 May 1939 and died 17 May 1993 in Cascade County, Montana with a married name Tuman.] They had one daughter, listed below, but later divorced. He married (2nd) Clarette Tafolla and they had a son, listed below. Patrick married (3rd) on 11 October 1974 to Sandra Fay Borup Mills, and they were married 32 years until his death. Patrick did not belong to a local congregation, but he was a passionate Christian and spent many hours studying his Bible and had informal Bible studies with friends. He died of cancer on 2 October 2006 in Helena, Monatana and is buried there in Montana State Veterans Cemetery. An unknown daughter LaSalle was born in about 1959 in Helena, Montana. Jonathan Alvin LaSalle was born on 14 November 1962 in Helena, Montana. He served in the U.S. Navy. Jonathan died on 18 May 2009 in Los Angeles, California and is buried in Montana State Veterans Cemetery. Carol Josephine LaSalle was born in about 1938 in Helena, Montana. She married (1st) Joseph John Olheiser on 18 June 1955 in Helena, Montana. [Joseph Olheiser was born in about 1934 in Morton County, North Dakota.] She then married Philip Alexander Lemieux on 21 February 1958 in Helena, Montana. [Phillip Lemieux was born in 1935 in Glacier Co., Montana.] She eventually lived in Vancouver, Washington with a surname of Wilks. Judy LaSalle was born some time after April of 1940 in Montana. As of 2006 she was living in Farmersville, Texas with a married name of Pierce. Rita Ann LaSalle was born in Montana, possibly around 1951. She lived for some time in Corvallis, Oregon, with a married name of Anderson. Later she moved to Helena, Montana, and served as an office manager for a local ministry there which was founded by her sister Bonnie. Bonnie Jean LaSalle was born in Montana. She married Mark K. Stevens on 27 December 1974 in Jackson Co., Oregon. They lived in Helena founding and running an organization called Manna Basket Ministries. Louise Mary Clayborn was born on 28 December 1918 in Hill Co., Montana. On 24 August 1936 she married Henry Schwartz in Glacier Co., Montana. [Henry Schwartz was born on 25 June 1914 in Hill Co., Montana.] Louise died on 10 April 1937, and and about three years later in 1940 Henry re-married. Henry died on 6 September 1972 and is buried in Calvary Cemetery in Hill Co., Montana. James Leroy Clayborn was born on 6 March 1921 in Hill County, Montana. He served in the U.S. Air Force from 28 July 1942 through 6 November 1945, then again from 4 February 1946 through 30 November 1962. On 1 June 1946 in Cascade County, Montana, he married Virginia Theresa Rapsch and they lived together in Great Falls, Montana from 1946 through 1959. [Virginia Rapsch was born on 6 April 1926 in Cascade County, Montana.] Virginia died on 18 February 1989 in Cascade County. James died on 28 November 1996 in Flathead County, Montana. Doris Mae Clayborn was born on 2 September 1923 in Hill Co., Montana. She married Harold Benjamin Christianson on 5 December 1944. [Harold Christianson was born on 31 July 1919 in Hill Co., Montana.] Doris died on 22 January 1977 and Harold died on 13 July 2002, both in Flathead Co., Montana. They are buried there together in Woodlawn Cemetery. Betty Jane Clayborn was born on 11 November 1926 in Hill Co., Montana. She married John Thompson in about 1945 and died on 24 January 1986 in Stanislaus Co., California. Donald Louis Clayborn was born on 27 March 1929 in Hill Co., Montana. Donald died on 2 June 1965 in Yuma Co., Arizona. He served in the military during the Korean War. On 23 July 1951 he married Madge Loretta Kirkaldie, a Native America, and at least for a while they lived in Helena. [Madge Kirkaldie was born on 10 February 1927 in Blaine Co., Montana and had been previously married and divorced from another Native American, Charles Calvin DeCelles (1924-1991).] It appears that they were parents to Donald Louie Clayborn, Jr. (born in about 1952), who plead guilty to theft from an organization receiving federal funding in 2008. It appears that they also had two other children, then divorced. Donald is buried in Highland Cemetery in Hill Co., Montana. Iva Belle Claybourn was born on 18 June 1889 in Jefferson Co., Illinois. She was living with her parents in 1900 in Rome, Illinois, but by 1920 she was living in Pondera, Montana. On 1 September 1922 she married Frank Leslie Randol. [Frank Randol was born on 3 September 1882 in California.] He worked on and drove motor vehicles. He lived in the Los Angeles area through the mid-1930’s, then was listed in the Yuba City directory from 1936 through 1955. Iva and her cousin, Rose Claybourn Marquard, lived near each other, and “Rose and Iva” were always thought of together as they were inseparable for years. Iva died on 28 December 1942 and Frank died on 6 June 1956, both in Yuba City, California. Maude Jane Claybourn was born on 24 August 1891 in Jefferson County, Illinois. On 16 July 1910 she married Joel Daniel Minor. [Joel Minor was born on 9 April 1890 in Jefferson County, Illinois.] The two lived in Marysville, California, and together had seven children, listed below. Joel died on 5 September 1954 and Maude died on 17 December 1979, both in Yuba City, California. Floyd Milford Minor was born on 18 June 1911 in Jefferson County, Illinois. Flloyd died on 1 May 1973 in Havre, Montana. On 18 June 1934 in Roosevelt County, Montana. Floyd married Ellen Marie Adamson. [Ellen Adamson was born on 3 February 1911 in Burke County, North Dakota. She first married Joe Maurice Filler on 25 August 1928 in Hill County, Montana, and they had a daughter Dorothy Filler.] Ellen’s daughter from a previous marriage, Dorothy Filler, was adopted by Floyd. They also had a son between the two of them. Floyd and Ellen broke up in the late 1940’s. [Ellen Adamson married Cecil Arnold Shew in about 1951. He was born on 16 June 1910 in Davison Co., South Dakota and died on 9 March 1985 in Flathead Co., MT. Ellen died on 10 February 2001 in Yellowstone Co., Montana.] Floyd married Olivia A. Molitor on 10 April 1950 in Hill Co., Montana. [Olivia Molitor was born on 4 September 1907 in Meeker Co., Minnesota.] Olivia died on 19 July 1981 in Hill Co., Montana. Dorothy Mae Filler was born on 3 July 1929 in Montana to Joe Filler and later adopted by Floyd Minor. She married Louis Whitcomb Klimper (“Lou”) on 4 September 1948 in Hill County, Montana. He was born on 14 April 1927 in Montana and at age seventeen, Lou joined the U.S. Navy to serve in World War II and spent his enlistment in the South Pacific. He later taught school in Dotson, Montana; Wallowa, Oregon; and Moses Lake, Washington. After his teaching career, Lou was a counselor for the Vocational Rehab Center and retired as a counselor from Montana State Job Service in Billings. The couple lived in Billings, Montana, and Lou died there on 5 May 2014. William Minor was born on 15 December 1930 in Hill County, Montana, to Joe Filler and was later adopted by Floyd Minor. As of the 1960 Havre city directory he had a wife named Teletha. Troy Ivan Minor was born on 11 April 1913 in Jefferson County, Illinois. On 28 June 1946 in Glacier County, Montana he married Avis Elizabeth Turk, who was previously married to Mr. Harrison. [Avis Turk was born on 11 October 1915 in Toole County, Montana.] Troy served in the U.S. Army from 22 March 1942 through 24 September 1942. Troy died on 11 January 1948 in Toole County and is buried in Highland Cemetery in Hill County, Montana. Avis died on 5 March 1998 in Flathead County, Montana with a married name of Hall. Troy died on 11 January 1948 in Toole County, Montana, when his car skidded off a highway at a curve. Thomas Douglas Minor was born 2 September 1915 in Jefferson County, Illinois. He married Dorothy Mabel Schwartz on 25 May 1938 in Blaine County, Montana. [Dorothy Schwartz was born on 8 May 1917 in Hill Co., Montana.] They had two sons. Thomas served in the U.S. Naval Reserve from 11 March 1944 through 18 December 1945. Thomas died on 5 September 1953 in Sweet Grass Co., Montana and is buried in Highland Cemetery in Hill County, Montana. Dorothy died on 20 November 1984 in Helena, Montana. His wife and their two sons are buried in Resurrection Cemetery in Lewis and Clark County, Montana. Robert Douglas Minor was born on 15 August 1938 in Hill County, Montana. Robert died on 13 August 1957 in Lewis and Clark County, Montana. William Francis Minor was born on 5 September 1939 in Hill County, Montana. William died on 23 November 1987 in Lewis and Clark County, Montana. Joel Daniel Minor was born on 14 November 1917 in Hill County, Montana. Joel died on 9 December 1990 in Yuba Co., California. Robert Morris Minor was born 3 April 1920 in Hill County, Montana. He married (1st) in about 1956 to Lawanda I. and in 1959 they had a son named Rex M. Minor. Robert married (2nd) in about 1959 to June Arvilla Coulter (1930-1988). He married (3rd) in about 1962 to Nellie Mae Kohl (1916-2004), who was previously married twice with three children. Robert died on 14 February 1992 in Yuba County, California, and is buried there with Nellie are buried together in Sierra View Memorial Park Cemetery. Rosemary Minor was born on 25 September 1926 in Hill County, Montana. She married Robert Johnson Whitmire in about 1948. [Robert Whitmire was born on 22 November 1923 in Seminole Co., Oklahoma.] They had three children. Rosemary died on 11 January 1981 in Sutter County, California. Robert died on 15 October 1998 in Lake County, Oregon. Benny Robert Whitmire was born on 23 September 1948 in Santa Clara County, California. Benny died on 24 February 1973 in Yuba Co., California. Danny Lee Whitmire was born on 12 April 1950 in Yuba County, California. Danny died on 18 October 1998 in Lake Co., Oregon. Karen Lynn Whitmire was born on 26 October 1951 in Yuba County, California. She married Jerry Lee Branum on 28 December 1971 in Washoe County, Nevada. [Jerry Branum was born on 27 January 1947 in California.] They had two children: Elodia Marie Branum (born in 1971 in Somona County, California) and Jimen L. Branum (born in 1974 in Sutter County, California). Jerry died on 24 January 1979 in Sacramento and Karen died shortly thereafter on 19 September 1979 in Yuba City, California. Vera Mae Minor was born on 21 November 1928 in Hill Co., Montana. Vera died on 19 January 1940 in Hill Co., Montana. Nina Olivia Claybourn was born on 26 November 1893 in Jefferson County, Illinois. She married Rudolph Cecil Austin on 20 June 1914. [Rudolph Austin was born 21 February 1893 in Greenville, Illinois.] Nina died on 3 November 1957 in Los Angeles County, California, and is buried in Forest Lawn Memorial Park Hollywood Hills. Rudolph died in September 1975. Madessa Fae Austin was born on 30 December 1915 in Illinois. Bonnilyn Ruth Austin was born on 14 March 1918 in Montana. She was proud of her World War II contribution working on aircraft. She was a loving and active mother involved in the PTA. She remained in contact with her aircraft and PTA friends until the end. On 19 May 1965 she married Fielding William Masters in Ventura County, California. [Fielding Masters was born on 28 June 1914 in Utah Co., Utah. He first married Unity Arletta Price (1914-1998) and she had son George Fielding Masters on 22 November 1942 in Los Angeles who later lived with her in Utah. Fielding Masters enlisted in the U.S. Army on 27 June 1945 saying he was single and without dependents. But he also started having sons in Los Angeles whose mother’s last name was Austin, most likely Bonnilyn.] Fielding died on 8 September 1999 in Northridge, California. Bonnilyn died 15 October 2012 in Northridge, California. Both are buried in Forest Lawn Memorial Park Hollywood Hills Cemetery in Los Angeles County, California. Leslie James Masters was born on 30 May 1945 in Los Angeles Co., California. Richard Fielding Masters was born on 4 July 1950 in Los Angeles Co., California. Clayton Robert Masters was born on 7 August 1953 in Los Angeles Co., California. Mark Austin Masters was born on 16 April 1955 and died on 16 December 1988 in Los Angeles Co., California. Kevin Masters was born 21 September 1960 in Los Angeles Co., California. Elsworth Cecil Austin was born on 24 May 1923 in Champaign Co., Illinois. Elsworth died on 27 March 1980 in Orange Co., California. On 26 May 1954 in Los Angeles County, California he married (1st) Mary C. Reynolds (or Robertson), who was born in about 1929. On 20 July 1967 in Los Angeles County, California he married (2nd) Marilyn S. Zagnoli (or Powell), who was born in about 1931. Elsworth is buried in Forest Lawn Memorial Park Hollywood Hills in Los Angeles Co., California. Charles Ivan Austin was born on 21 November 1926 in Champaign Co., Illinois. Ruth Cordelia Claybourn was born on 21 December 1895, and lived in Los Angeles. In about 1913 she married (1st) to Carroll Azy Bundy (1894-1963) and they later divorced. Nevertheless, they had two children. Ruth married (2nd) Howard Gordon, who died while they were married. Ruth was later married one or two more times. It looks like her last husband was Arthur C. Waters, as he is listed as living in Pasadena, Los Angeles County, California, with a wife named Ruth in the 1958, 1959, 1961, 1962 and 1963 editions. Ruth died on 16 December 1965 with the surname of Waters. Pauline Edna Bundy was born on 9 February 1915 in Marion County, Illinois. She married Lowell Edwin Redwine (1911-1982) in about 1939. He was a geologist. They had two sons, listed below. Pauline died on 13 December 2005 in Deschutes County, Oregon. Craig Jeffrey Redwine was born in 1947 in Santa Barbara County, California. Keith Douglas Redwine was born on 12 June 1949 in Santa Barbara County, California. He married Susan Jane Krause in Clark County, Nevada, on 6 January 1971 and they divorced in March 1976 in San Diego County, California. He married Georgianne Bancroft on 5 August 2006 in Deschutes County, Oregon, and Keith died there on 9 August 2009. Willoughby Newton Bundy was born on 10 January 1917 in Marion Co., Illinois. He worked as a crewman on ships from 1936 through about 1943. In about 1944 he married Eleanor Mae Thomas and together they had six children. [Eleanor Thomas was born on 19 October 1920 in Searcy Co., Arkansas.] Willoughby died on 13 April 2002 and Eleanor died just weeks later on 7 May 2002, both in Los Angeles Co., California. Carole Diane Bundy was born in 1945. Eric Newton Bundy was born in 1947. Mary Catherine Bundy was born in 1948. Donna Ann Bundy was born in 1953. Tina R Bundy was born in 1956. Guy E Bundy was born in 1959. Elmer Ellsworth Claybourn was born on 28 February 1898 in Jefferson Co., Illinois. In about 1924 he married Edna J. Humphreys and they lived in Los Angeles. [Edna Humphreys was born on 10 January 1901 in Wyoming. She had been previously married about 1919 to John Levere McGillvrey Jr. (1897-1987) and gave birth to a daughter. The daughter was probably adopted by Elmer because she took his surname. Marcelee was born 29 January 1921 in Walcott, Carbon Co., Wyoming and died 21 January 2010 in Kern Co., California with the name Marcelee Claybourn Casey. From 1941-1944 she was a student nurse in Santa Barbara, CA and a full nurse as of 1945.] Elmer died on 29 July 1941 in Carbon County, Wyoming. Edna died on 14 July 1960 in Orange Co., California with a married name McCandless. A boy was born stillborn on 23 August 1900. Harriet McCrary Claybourn died soon after the birth. They were buried in the same coffin.